Click here for more pictures of clients and their dogs. I want to thank you for training Susie, a dog that I fostered that was in need of every chance she could have for a good life. 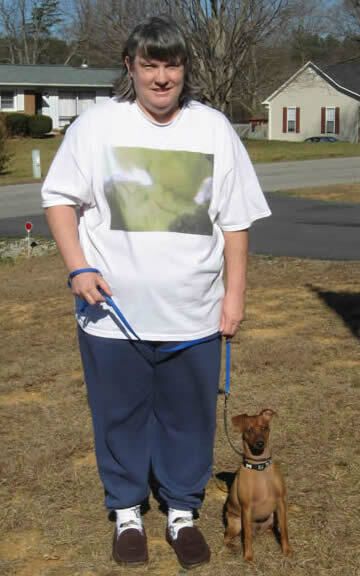 Susie is the puppy that was set on fire by her owner’s boyfriend and left to die in Greensboro, NC. 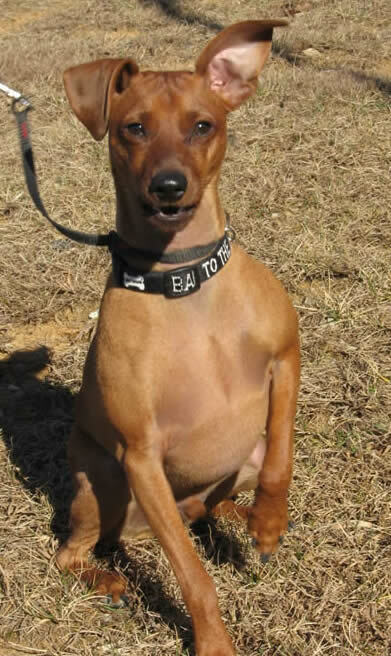 Animal Control officers took her to the Guilford County Animal Shelter. The shelter took care of her medical needs while she recovered and while I fostered her. She received lots of love but as she grew stronger, we needed to teach her boundaries and rules since we wanted her to be successful in her permanent home when she was adopted. 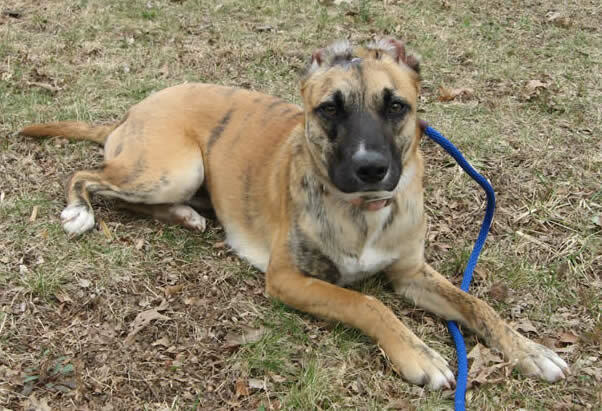 Susie is a pit bull/shepherd mix and she has a strong will. This has to be how she survived such a horrible crime against her. But as she healed, and became the puppy she should have been, you intervened and helped us to train her. You trained us too. Because of your guidance and instruction, Susie is living a happy and very productive life in her permanent home. 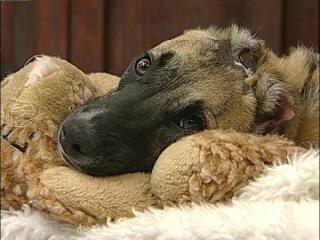 It is very easy to feel sorry for Susie since she has scars from the burns and her ears are burned completely off. 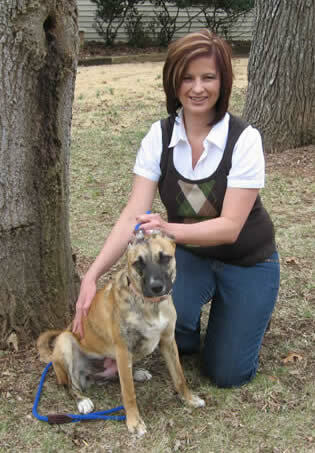 She needs and craves direction and you taught us and her new owner, Donna Lawrence, how to give her that direction. 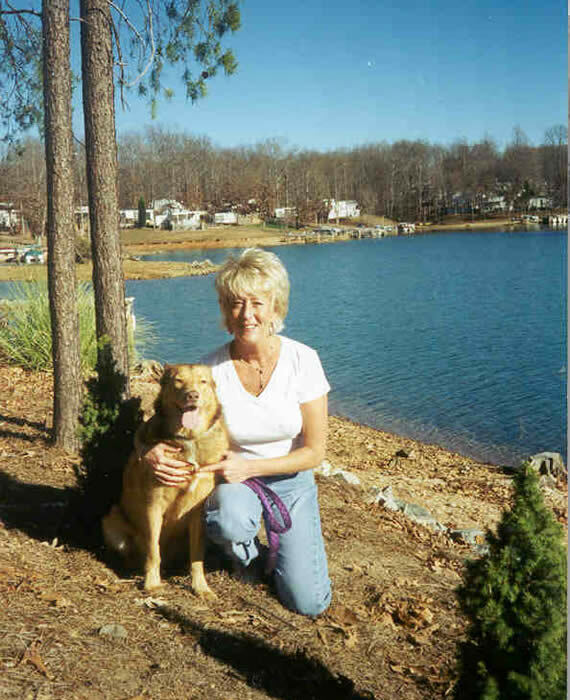 Today, Susie is an advocate and voice for abused animals in North Carolina. Because of her horrific ordeal, citizens of NC look to Susie as a “poster dog” for changing the Felony Animal Cruelty laws. 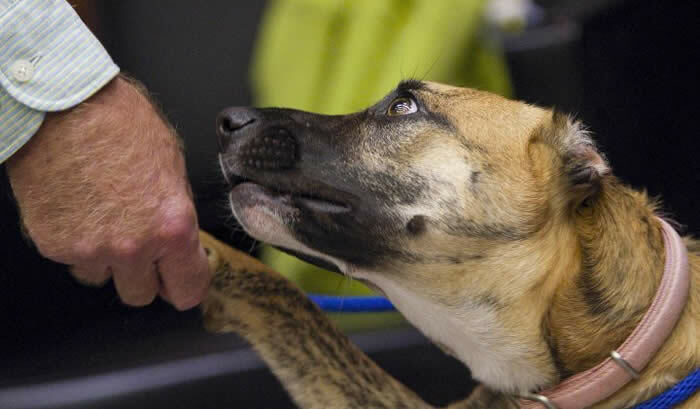 NC residents want to see a conviction of Felony Animal Cruelty changed to a Class F felony (from a Class I felony) because that would allow the judges to give jail time to those that are convicted. 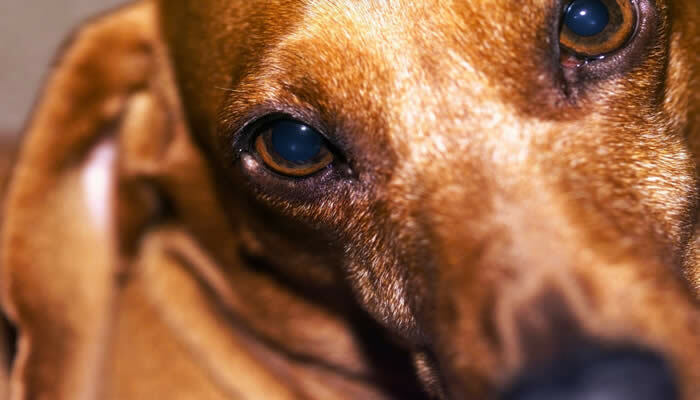 Current laws in NC do not allow for jail time for a conviction of felony Cruelty to Animals. Susie’s voice is louder than ever when she goes to many events and people see how well behaved she is. She is a happy, loving dog that will make great changes for our state. Karen, without your help, Susie and other abused animals would not have the chance that we may be able to give them today. I cannot thank you enough for your patience and love with Susie. Karen recently began working with my (8 months old at the time) Min Pin. Harley is a very smart dog, very high energy and has Great personality. He wants to be the Boss. Karen worked with us both to to teach him to respect me as being the Boss. The play biting has decreased drastically. On a scale of 1-10 where he was a 10 he is now a 2! He walks very well on a leash with heel command. He will sit and stay and down-stay on command. His is learning to obey a sit-stay command from a distance. He comes on command. He is learning to go to a pillow that we named his "place" instead of charging towards to door when the doorbell rings. I'm very pleased with the training Harley received from Doggone-It and Karen Regan. I highly recommend them to anyone that wants a well mannered and obedient 4 legged child! We are much happier and Harley is as well! We wanted to write to you and tell you what good and obedient puppies we are because you came to our house and trained us! Before you started coming to our house, we weren't always good puppies. In fact, sometimes we got into real serious trouble -- like the time we ate Daddy's feather pillow and the time we chewed up all the cushions on the outdoor furniture (just to mention a couple of incidents). Since Mommy called you and you taught us what to do and how to act, we behave much, much better. Mommy even lets us run and play with all of the little boys now. One of them is not quite a year old, and we are very, very careful when he's crawling around. If Mommy tells us to go to our place, we are obedient and we go there until she tells us that we're through. It's such fun playing with the little boys. Before you came to train us, we sometimes jumped up and got too rough with them and Mommy had to put us in our crates. There are so many things that we do now that make us happy. We can take long rides in the car and go for walks with Mommy and Daddy. When we're riding in the car, we don't try to jump in the front seat, and when we take walks, we walk right beside Mommy and Daddy and don't try to lead the way! The best thing that's happened is that Mommy and Daddy say how blessed they are to have such good puppies. We are so proud when we hear them saying such nice things about our behavior, and it's all thanks to you! Well, we want to say a big "Woof-woof" to you for helping us be the kind of puppies that everybody loves! This letter is written on behalf of myself and my dog, Goldie and to anyone who wants a better behaved dog and a better, closer relationship with their dog. 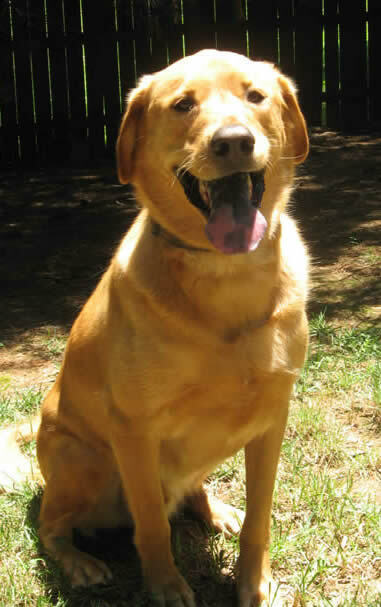 Goldie was a stray, abandoned at Belews Lake. A lot of people were feeding her, but no one wanted to give her a real home. We saw how sweet she was and decided to adopt her as our own. We thought she had potential but would need extra love and discipline in order to become a good house dog and companion to our other dog, Duke after running wild for so long. Karen Buck Regan of Doggone-It! has provided the solution we were looking for in our goal to make Goldie the best dog she can be. As of Goldie's first lesson it became apparent that Goldie wanted and needed the instruction Karen provided in Basic Obedience. Watching her handle Goldie you can see dedication, knowledge of training and a lot of love for what she does. Goldie looks forward to her visits as well as I do and it is also wonderful that she comes to us, instead of me having to take Goldie to a kennel for classes. In addition to the one on one training time Karen takes with Goldie, she also is teaching me the tools I need to work with Goldie by myself and with family and friends. Karen has enhanced Goldie's life as well as Goldie's relationship with me as her "alpha dog" and we are truly grateful for that! I hope that Karen will always be a part of Goldie's life, which started out so sad. 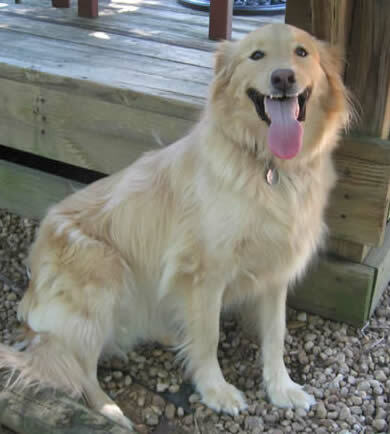 Now Goldie is happy, healthy and well behaved and gives me great joy as her owner and pal. Thank you Karen! You are truly talented in this line of work and we wish you much success and hope many more dogs can benefit from your expertise! sometimes to roll over even though he knew what I wanted him to do. I am writing to highly recommend Karen Buck Regan of Doggone-It services. For the better part of this year Karen has been tending to my black lab and my tabby cats during a number of extensive business trips that have kept us away. Karen seems to have a deep understanding of and love for animals. She plays retrieve with my dog, pets the cat and they are happy as larks when we return home. She also volunteers to bring in the paper, turn lights on, set out the trash cans, ect. so that the appearance of someone being home deters potential break-ins. Above all though is the peace of mind I have while away in knowing that my beloved pets are getting prime attention and care. I recommend Doggone-It to you without reservations of any kind. 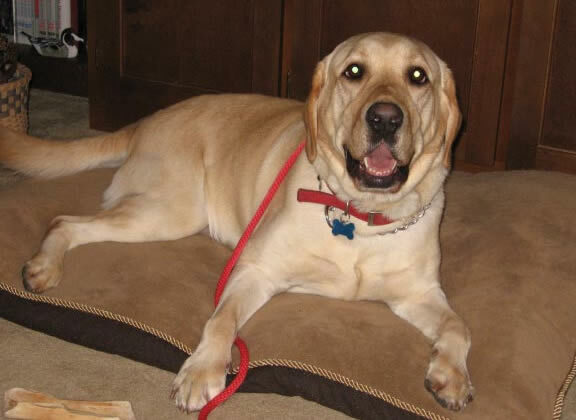 My husband and I both felt that we benefited as much from Doggone-It as our dog Maggie did. The lessons gave us guidelines to follow and confidence in our ability to teach our dog. Maggie actually responds in an appropriate manner to a command now. Maggie responded so well to the trainer, Karen. Karen made the training look easy and using the correct techniques it is easy. I wouldn't hesitate to recommend Doggone-It.